Hi everyone! This is a wall hanging I had made using a few of Donna Salazar's recent releases! The background of the wall hanging is made of corrugated board that was painted, spritzed with Smooch Spritz, inked with Denim Mix'd Media Inx and embossed with Denim Mix'd Media Inx Embossing Powder. Phew... ran out of breath with that sentence! LOL. Behind the corrugated board, I layered watercolor paper from Donna's new Mix'd Media Stax, and behind that, I added a layer of The Crafty Chronicle. This is my fairy doll! How cute is this piece? It is Donna's new paper doll chippie by Want2Scrap. She is covered in The Crafty Chronicle that was cut with the coordinating dies by Spellbinders. 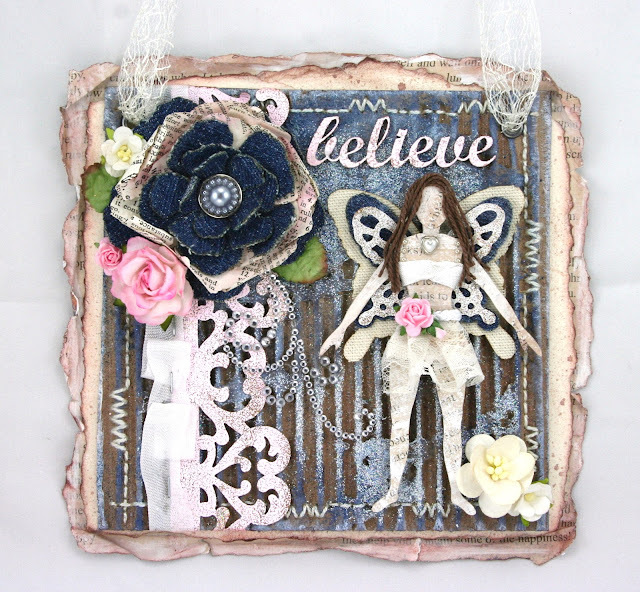 Her wings were cut using the Wonderful Wings dies that are also manufactured by Spellbinders. The 'believe' chippie is made by The Dusty Attic. I gave it some texture by embossing it with Chiffon Mix'd Media Embossing Powder. This flower is made up of layers of denim and layers of The Crafty Chronicle that were cut with Rose Creations dies. Thanks for stopping by to take a peek! Have a beautiful day! This is gorgeous Natasha! Love all the details! Hugs!